This raspberry Charlotte Cake was my baby girls first birthday cake. She loved every part of it, the cake, the lady fingers and especially the raspberry mousse! 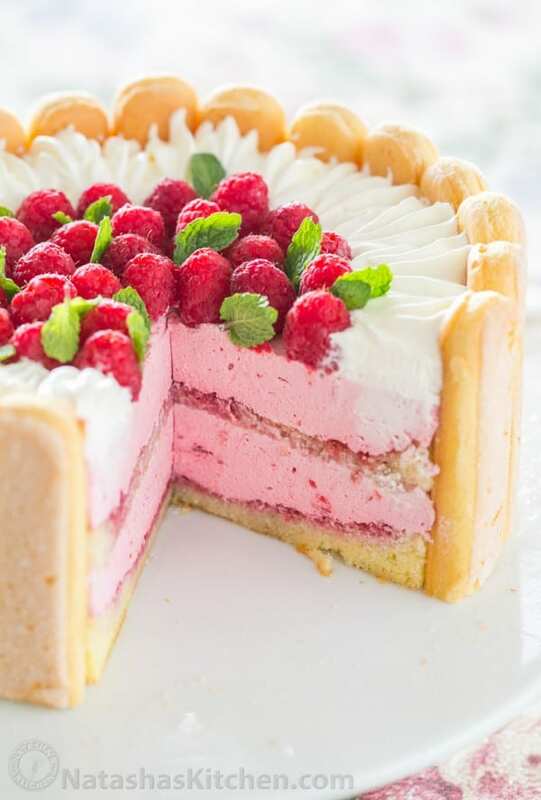 This cake is as yummy as it is beautiful. 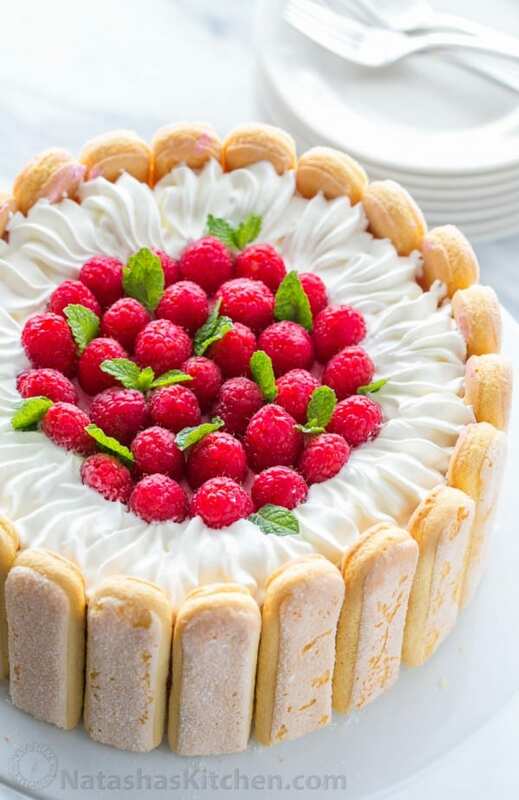 Of course this is our version of the classic French Charlotte Russe cake. Everyone seems to take their own spin on it. I love how the sweet/tart mouse and raspberry preserves complements the soft cake and lady fingers. European cakes are my favorite because they typically aren’t overly sweet but rather enjoyable. P.S. I was very detailed with my photos and instructions so you would succeed but this recipe really is not overly complicated. I hope you love this fantastic Charlotte dessert! 1. 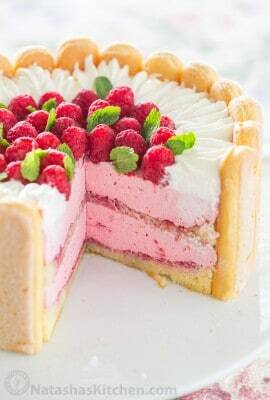 In medium sauce pan, combine: 10 oz frozen raspberries and 1/2 cup sugar. Cook stirring occasionally until jam consistency. 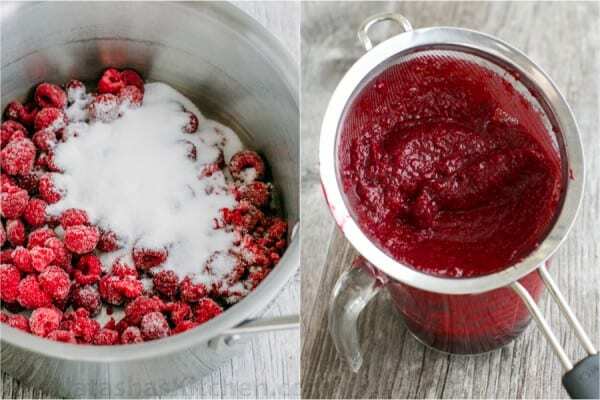 Remove from heat and strain through a sieve, pressing on the fruit with a spoon to extract as much raspberry juice as possible (you should get 2/3 cup syrup). 2. Into the raspberry syrup, stir in 2 Tbsp lemon juice and 1 Tbsp gelatin. Pour syrup back into sauce pan and place back over medium heat, whisk until gelatin is dissolved. Do not boil. Remove from heat and cool to room temp. 1. Line a 9″ springform pan with parchment paper. Preheat oven to 350˚F. 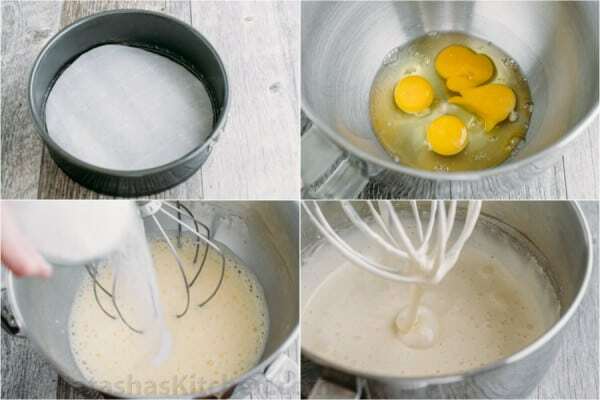 In the bowl of your mixer with the whisk attachment on high speed, beat 4 eggs for 1 minute. Gradually add 2/3 cup sugar and continue beating on high 7 min until thick and 3 to 4 times in volume. 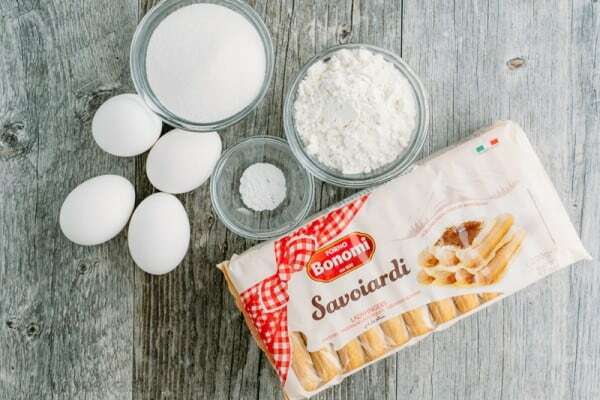 Tip: European sponge cakes really rely on the volume of the eggs to rise properly. Make sure to beat it long enough and don’t over mix after adding flour! 2. Stir together cake flour and baking powder then sift flour into whipped eggs in 2 additions, folding to incorporate between each addition. Scrape from the bottom to catch any hidden pockets of flour and fold just until incorporated – don’t overmix. Bake at 350˚F for 23-25 minutes or until top is golden and springs back when poked lightly. 3. 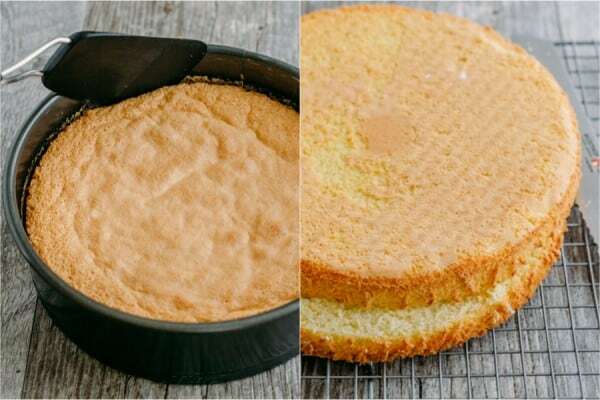 Once it’s out of the oven, remove cake from pan by sliding a thin edged spatula around the edges. Transfer to wire rack, peel back parchment and cool to room temp. Then slice cake layers in half horizontally. Tip: If you want to serve it on something besides the bottom of the springform, place a 9″ cake circle on the bottom of your springform pan for easier transferring. 1. Cover springform walls with plastic wrap. 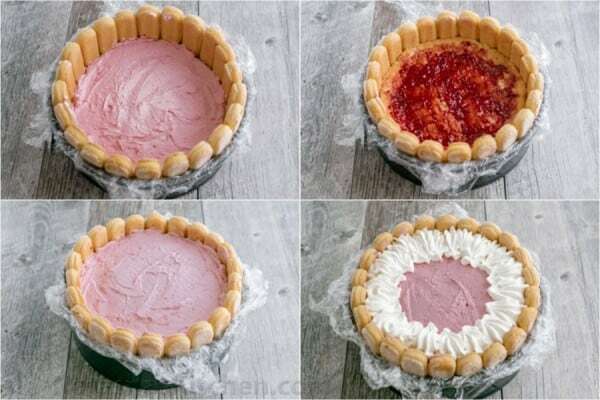 Trim off 1/2″ all around the edges of both cake layers (I used kitchen scissors) and place the first layer into the bottom of your springform pan. Trim about 1/2″ off one end of all lady fingers. 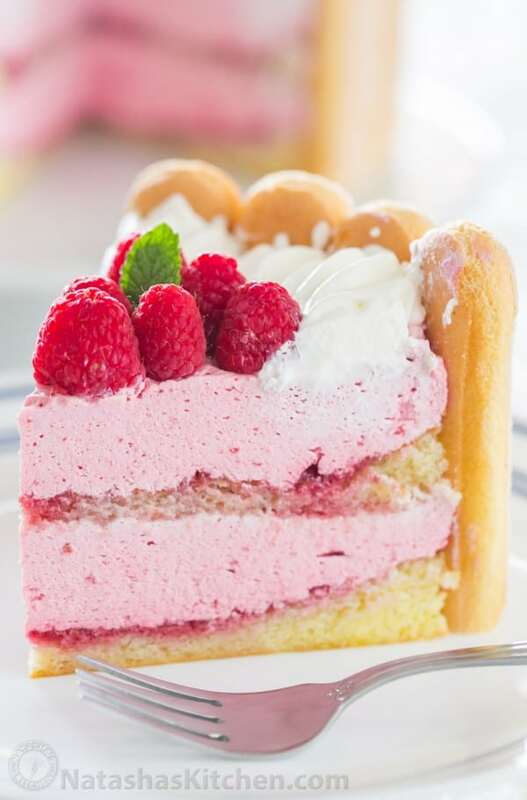 Place lady fingers in a tight ring, cut-side-down, around the cake base then brush cake with 1/3 of the simple syrup. Brush backs of lady fingers with 1/3 of syrup as well. 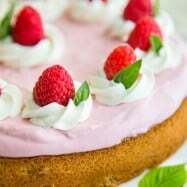 Spread 1 1/2 Tbsp raspberry preserves over cake. Set aside. 2. 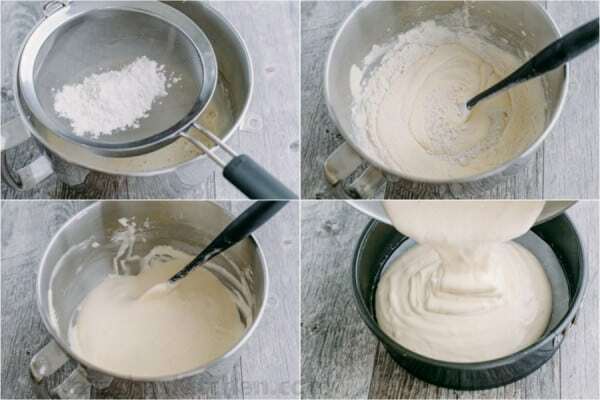 With the whisk attachment, beat 3 cups heavy cream with 6 Tbsp powdered sugar on high speed until thick and spreadable. 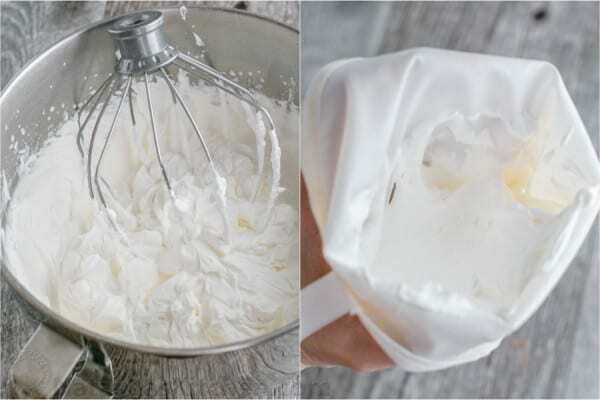 Remove 1 1/2 cups of whipped cream to a piping bag fitted with a star attachment and refrigerate to use as topping later. 3. 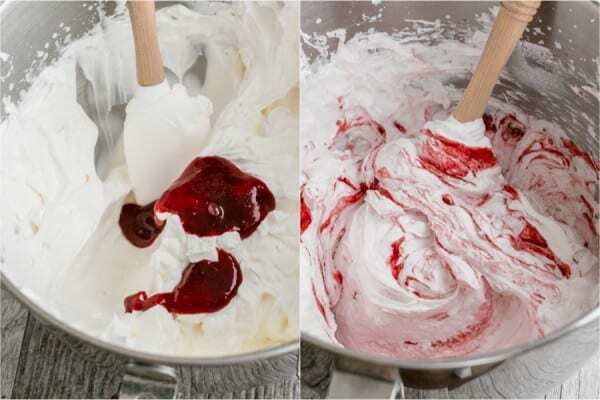 Once raspberry syrup is completely at room temp (don’t wait way too long or it will thicken and become difficult to blend), fold it into remaining big batch of whipped cream adding 1/4 syrup at a time and folding between each addition. This is your mousse. 4. Spread 1/2 of the mousse over cake layer inside the springform. Top with second cake layer, brush with remaining simple syrup and spread with 1 1/2 Tbsp raspberry preserves. Add remaining mousse. 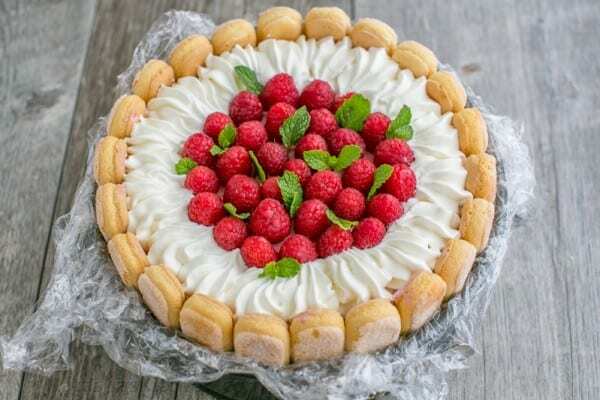 Pipe whipped cream and top with fresh raspberries and mint leaves if using. Cover with plastic wrap and refrigerate until set (3 hours or overnight). To serve, remove springform walls and plastic wrap. Hi, I just have a question. How far in advance of an event can you make this cake? And how long will it keep once it’s been cut? Made this for a luncheon as a finally. 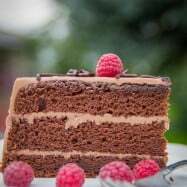 Which cake recipe is correct ? 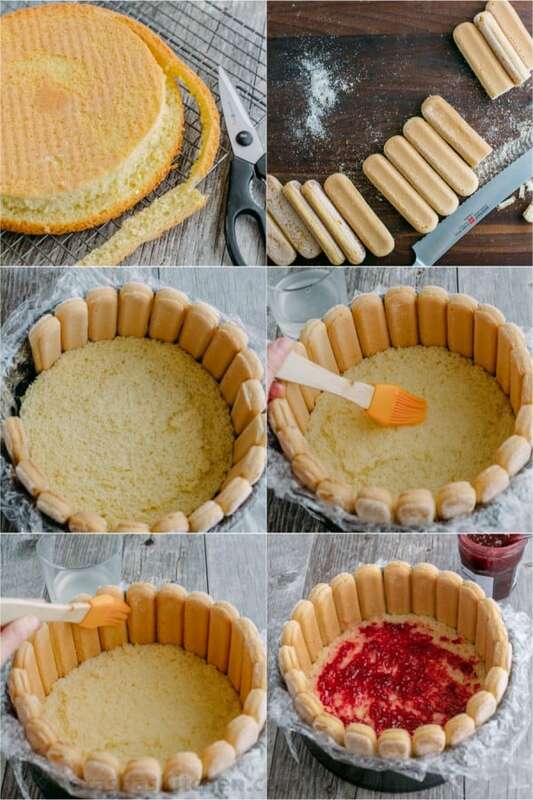 i’m wondering how you get a round cake to put in the springform pan when your directions say to ‘cut the cake in half and trim’. when cutting in half you have a straight side. so how does it become a round cake to put in the pan? WOW!!! so grateful to find your site! I made the Charlotte cake for my mom’s birthday. So far, it has prepared beautifully. Tonight’s taste will reveal all. I am always asked to bring dessert and I have recently been challenged to make lactose free desserts. Thankfully there is lactose free whipping cream available. Everyone loved it…. I have multiple requests for future birthdays. One thing I am going to try is rather than brush with simple syrup I am going to brush with a raspberry liqueur (not Chambord too pricey…lol). We are huge lemon fans. Can we kick up the lemon a notch, without disrespecting your well thought out and tested recipe? I had a bit of an ‘oops’ moment while cooking the raspberries–I misread the directions and ended up actually *making* jam, which didn’t exactly fold in well with the whipped cream. 😅 On the second attempt, however, it all came together wonderfully. Hi Natasha, In the video you say all purpose flour and in the recipe it says cake flour, which one do I use? If I wanted to make and assemble the entire cake ahead of time, how far in advance could I do that? Hi, this recipe looks amazing!! 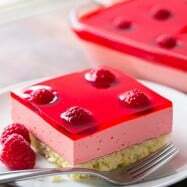 I just have one question, would I be able to use agar agar instead of gelatine and if yes the same amount? I love your blog. I was reading up this recipe and wondering if I could use the same mousse recipe with mangoes instead. I just made this cake for my birthday tomorrow. It is now sitting in the refrigerator. Can’t wait to see the final product tomorrow. Wish me luck. In fact, I’m a bit worrying about the cake layers, I’m afraid it would be too soggy after brushed the simple lemon syrup, 1/3 cup for each looks a lot to me. And my cake layers are very sticky. Not dry. Hi Natasha, thanks for your prompt response. I also thought about this, however, maybe not underbeat?! Maybe underbake?! In fact, the eggs were beaten to about triple size, and the cake did rise up. The only difference is I am using 8″ springform pan instead of 9″. I only had 8″ size. And my baking time was around 35 mins. The toothpick came out a bit sticky but no batter on it. Hi Natasha, I made a sponge cake without adding baking powder. 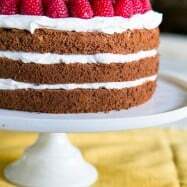 Why do you use baking powder in your recipe? 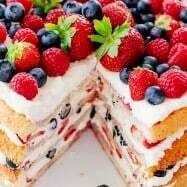 I have a daughter who has been begging me to make this cake, but she isn’t really a fan of barries in general, so she wants me to use peaches instead of raspberry’s, is that posseble or it not work? I mean I know how to makes peach marmelade, but this is a little out of my comfort zone, any advice would be helpful. This is beautiful!! Just a question. In your video the recipe is for 2-9 in cakes and the written recipe is for 1? Can’t wait to try this recipe! Just two questions for you! 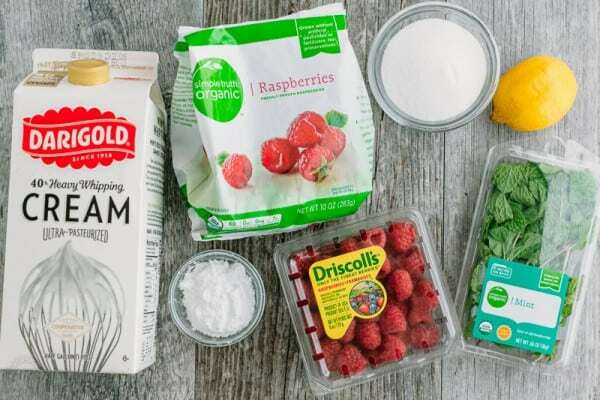 Can you swap out frozen raspberries for fresh without changing anything? 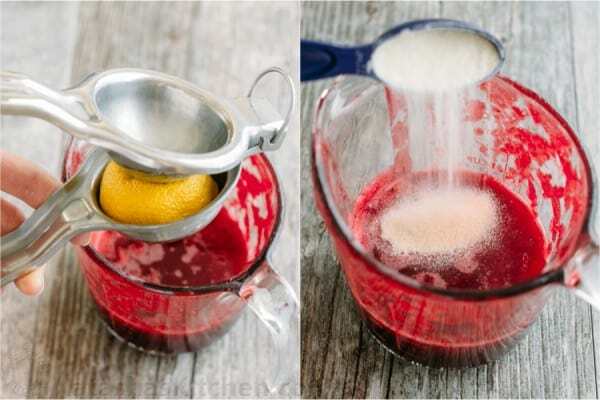 Also when making the raspberrie syrup for step 2 you say to remove it from the heat again but I am wondering am I adding the gelatin to just lemon juice or right into the raspberry after it has been through the sieve? Hi Natasha, I made this gorgeous and delicious cake for Christmas day. It was a hit!! I made this cake for my Baba for her birthday and it was such a hit! Thanks for sharing and the step by step was fantastic! Hello Natasha. I’m a fan of your recepies. Thank you for sharing so kindly.